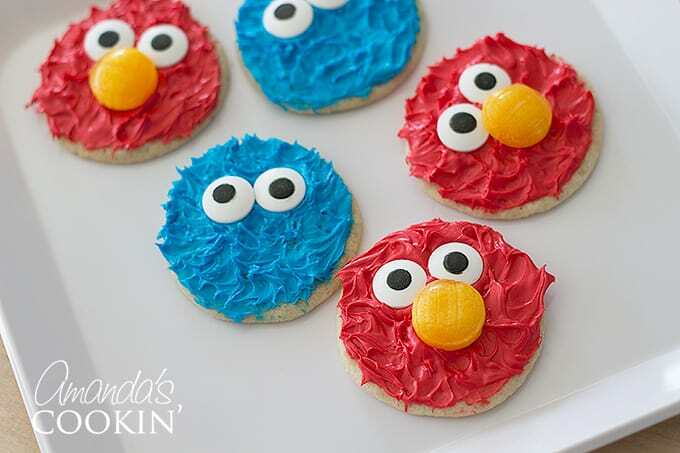 Oh my gosh, Cookie Monster and Elmo cookies! How can you resist the cuteness! That’s why I just had to make them. After all, Cookie Monster and Elmo were both a big part of my childhood, and I can’t resist adorable edibles, like our Bear Cookies as well! 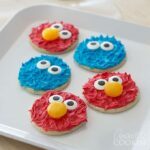 These Cookie Monster and Elmo cookies would be perfect for a Sesame Street themed birthday party too! 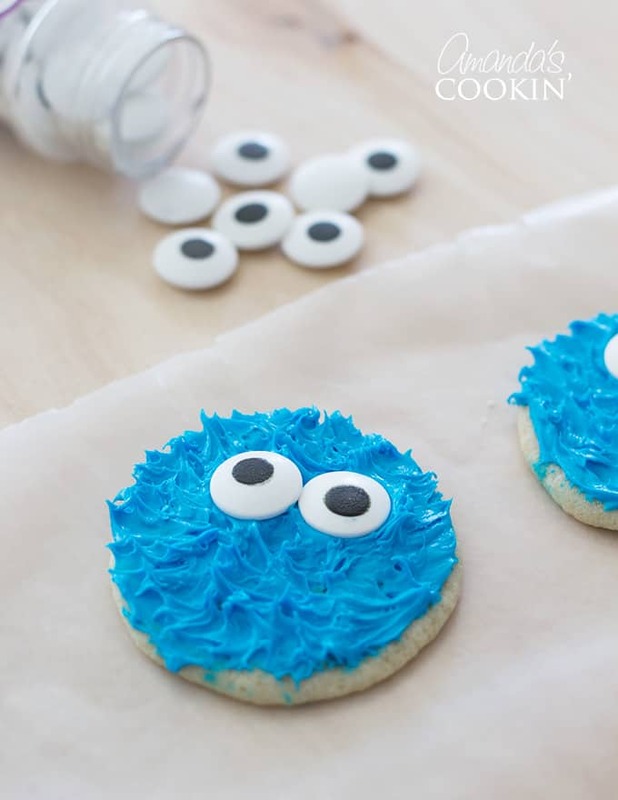 These adorable cookies are used in my Cookie Monster Freak Shakes too! There are several different kinds of Cookie Monster cookies out there, but I’m going to show you how to get that fun Muppet hair look without a special decorating tip. 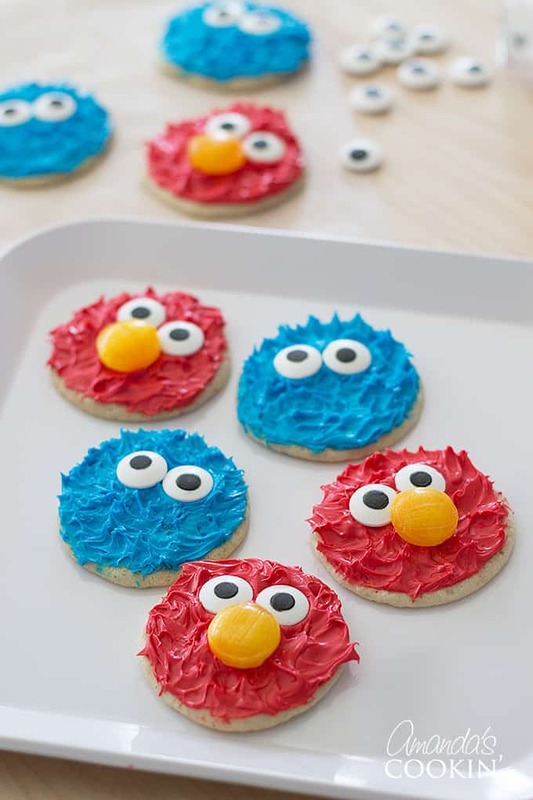 I didn’t see much in the way of Elmo cookies, unless you want to use Royal Icing. So we decided to go ahead and make both! It’s funny because this recipe was so spontaneous. When we were brainstorming ideas for the Cookie Monster Freak Shake, I was struggling with just how I was going to make Cookie Monster’s face. That’s when my mom (Amanda) suggested making him out of sugar cookies. What a perfect idea! That’s where these adorable little cookies blossomed from. 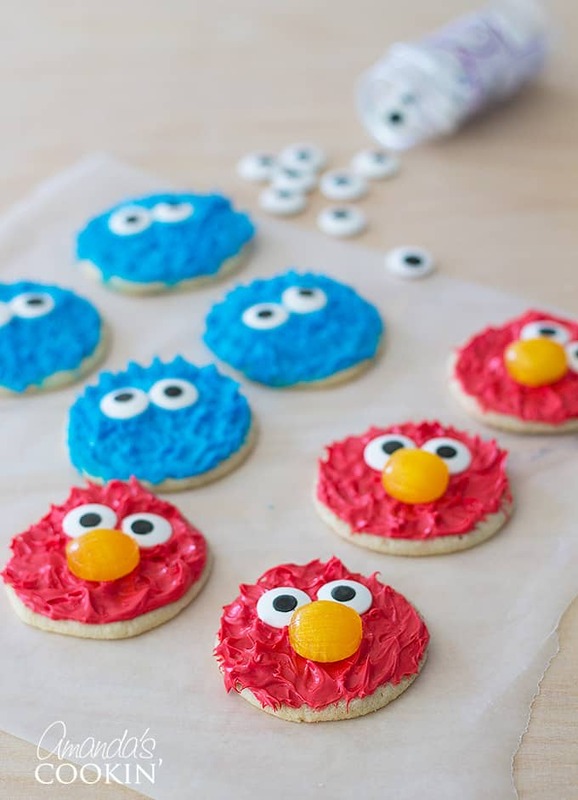 We actually didn’t intend on making Elmo cookies, but once we were making these cute cookies we saw how incredibly easy it is to make them and decided to make super easy Elmo cookies as well! 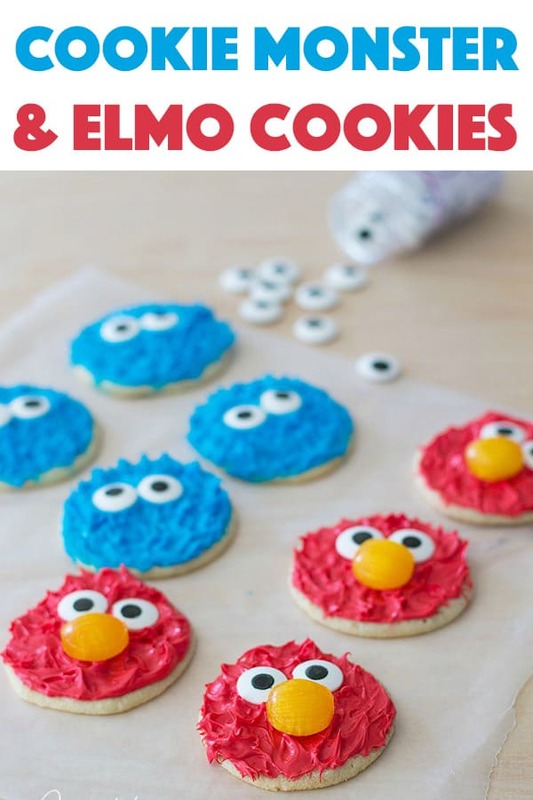 Why make Elmo and Cookie Monster Cookies? These cookies are absolutely perfect for a birthday party, and even more perfect for someone who is looking for a cheap and easy way to make treats for it! I’ve seen some pretty adorable Cookie Monster and Elmo themed goodies. For example, there’s these darling Cookie Monster donuts, these Cookie Monster cupcakes, and even this Cookie Monster ice cream! I realize I’m sharing a lot of sweets, but kids will love this Elmo spaghetti dinner as well! * Please don’t use liquid food coloring. 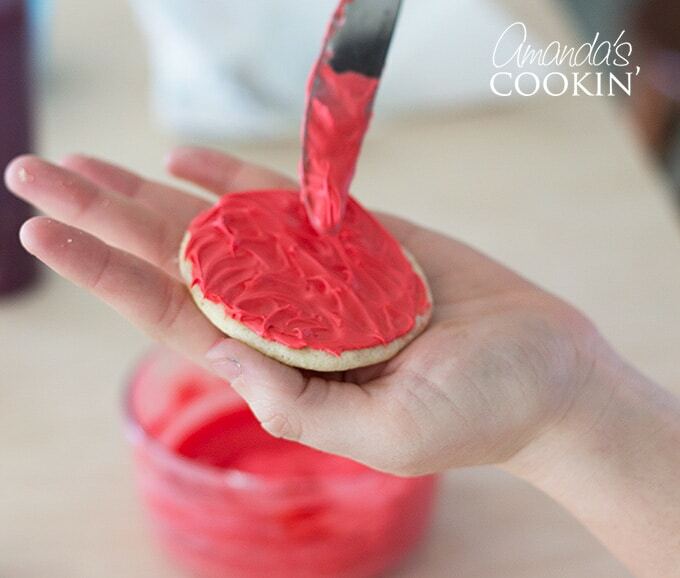 This will make your frosting too thin and you will not get the vibrant color you need. You WILL throw it away and be disappointed. Only use gel food coloring. As you can see from the ingredient list above, I have provided a couple of options for you. 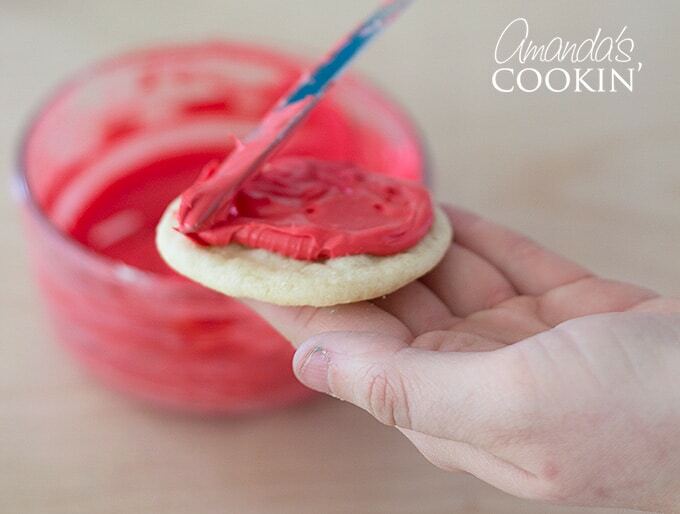 If you prefer to make your sugar cookies from scratch, you can absolutely do that. We used a tube of refrigerator cookie dough which can be quickly sliced and baked. No fuss, no muss. If you live in an area where you can’t purchase prepackaged sugar cookie dough, you can use my sugar cookie recipe or you can use your own. Another option is the frosting. We used a prepackaged tub of vanilla frosting. Any brand will do as long as the frosting is white. Again, if you don’t have access or prefer not to use these products, you can make your own. I have two versions of homemade vanilla frostings linked above. 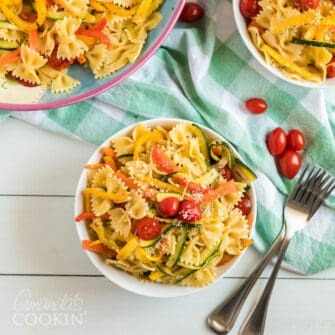 We used simple and store-bought ingredients so it was a quick and easy tutorial that absolutely anyone can master! First, you need to bake your sugar cookies and let them cool. While the cookies are cooling you’ll tint your frostings. Separate the white frosting into two bowls. 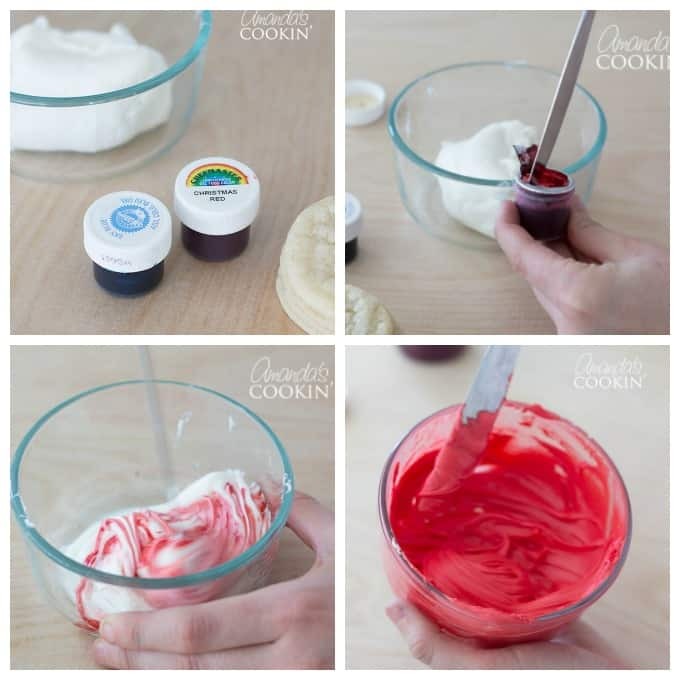 Use a toothpick or a butter knife to lift a small amount (less than a 1/8 teaspoon) of gel food coloring out and add it to one of the bowls of frosting. This is all experimentation. Mix it all together and add more if needed to reach the desired color. Repeat for the second color. 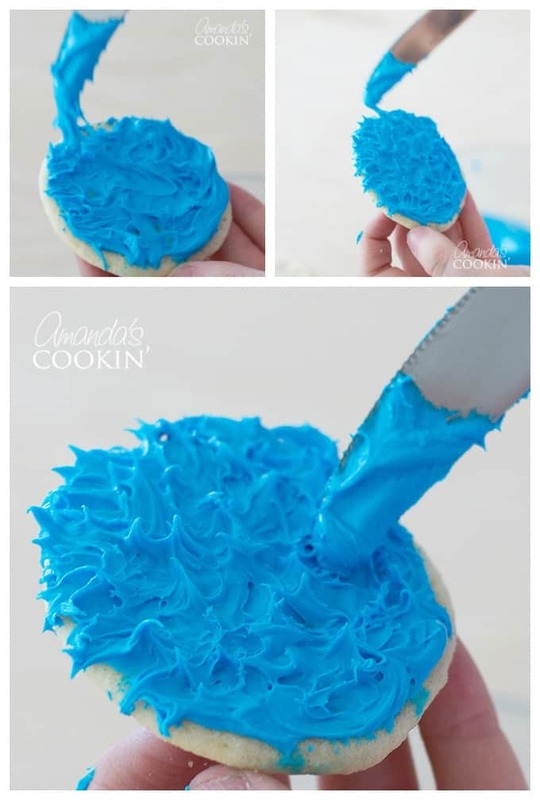 To decorate your Cookie Monster and Elmo cookies and make the frosting look like that fun muppet hair we all know and love first spread some colored frosting on the sugar cookie. It’s not much more complicated than that! All that’s left to do is add two jumbo candy eyes. 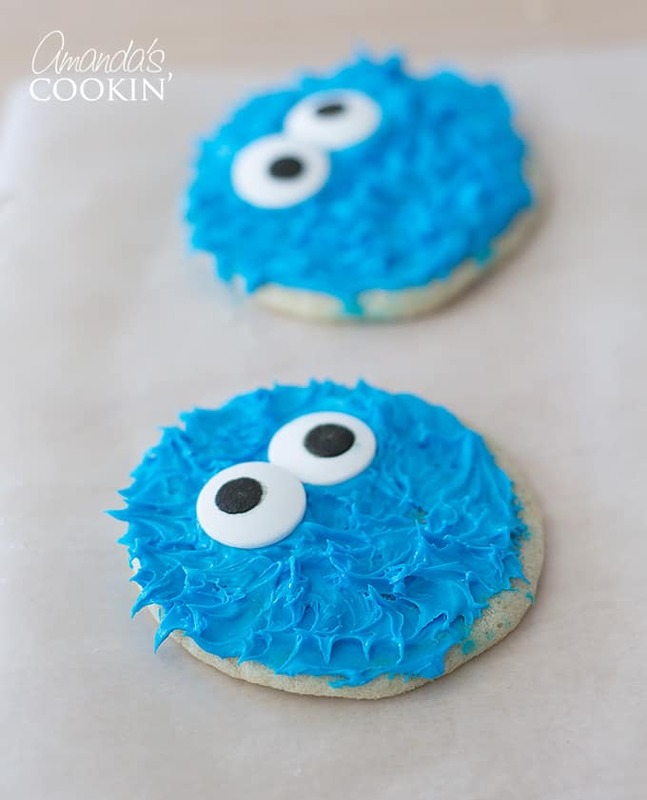 To look like Cookie Monster, make sure you position the eyes so they look jumbled or cross-eyed. For Elmo, add a butterscotch disc for the nose. We found that some of our candy eyes were not perfectly centered. 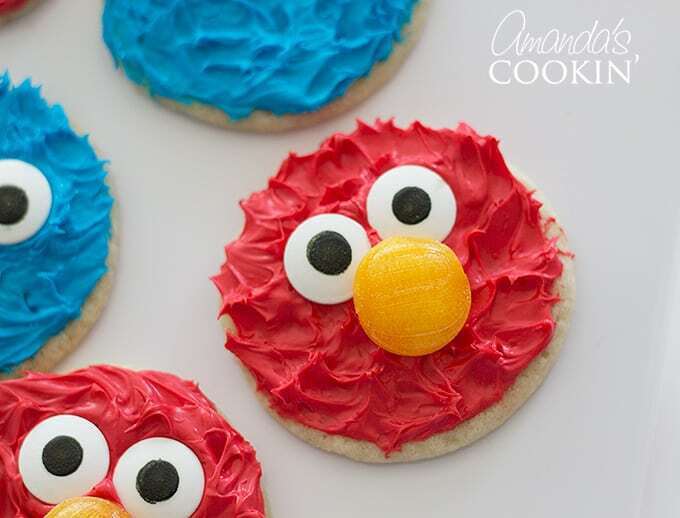 That was great because we used those for Cookie Monster and used the centered ones for Elmo! Here are a couple close-ups. Just because they are so darned cute! If you liked these Cookie Monster and Elmo Cookies you HAVE to check out the Cookie Monster Freak Shakes made from these adorable cookies! If you like cute food you’ll love our Easter Bunny Cupcakes, as well as our rainbow themed recipes! 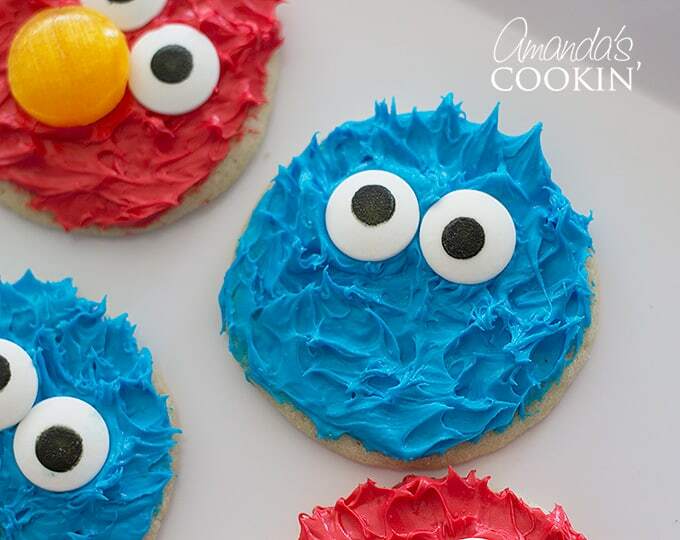 You also won’t want to miss these adorable Cookie Monster Cakes either! if i need these cookies for saturday morning, can i frost them tonight (thursday)? do i need to store them in the fridge? Can I make these cookies a few days in advance? Yes, the frosting will set up and harden a little. Store in a single layer covered in plastic wrap or foil.